In each Wordhunt puzzle you have to find the words and cross them off. It couldn't be simpler or more fun. 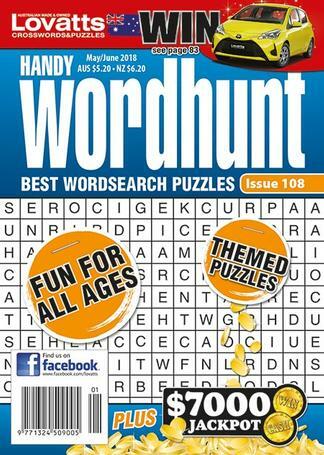 Handy Wordhunt is the ultimate wordsearch magazine in a handy size. The puzzles have all been hand crafted around interesting themes. Some wordsearches have the added twist of a hidden answer found after you cross off all the words. Others have the words twisting through pathways in the grid. Wordhunt is a great magazine for all ages and all levels of skill. I think Lovatts Handy Wordhunt magazine is great,anyone can have fun doing it.